Sundials are perhaps the most ancient of scientific instruments, and the earliest known form of time-keeping. They probably started life as poles in the ground with the direction and length of the shadow giving an approximate time of day. However, by the middle of the second millennium BC there were already fixed and portable versions of more accurate sundials being produced in the Middle East, Egypt and China. These early sundials relied on the height of the sun in the sky to indicate the time by the length of the shadow it produced. An ivory diptych dial made in Nuremberg by Johann Gebhart in 1556. Nuremberg was famous for its ivory sundials during the sixteenth and seventeenth centuries. From the Whipple Collection. More sophisticated forms were developed by the Greeks and Romans - these were normally bowl-shaped dials with vertical or horizontal gnomons (shadow-casters) and hour-lines marked in the hollow of the bowl. The Romans also produced new forms of portable dial, such as the pillar dial and the ring dial; like all the others, they depended on the altitude of the sun to tell the time. Unlike dials which depend on the direction of the sun, these instruments were relatively easy to make. However, neither vertical nor horizontal gnomons would satisfy the requirements of a direction dial because the shadow they cast at a particular time of day varies in direction from season to season. It was not until around the first century A.D. that it was demonstrated that a gnomon set parallel to the Earth's axis would cast a shadow in the same direction at the same time every day of the year. Ptolemy discusses such sundials in his Analemma. But even after that time such direction dials only slowly superseded the altitude dials, and it was not until the twelfth century that they became common. 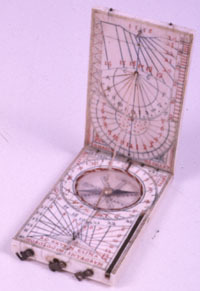 Portable direction dials did not appear until much later, since it was not until the advent of the magnetic compass that such dials could be correctly oriented. While altitude dials were simply turned towards the sun, and fixed direction dials could be set on the meridian permanently, it was impossible to use a portable direction dial if the direction of South could not be found immediately. Compasses were first added to sundials round about the end of the fourteenth century and after that time direction dials proliferated. Altitude dials such as ring dials and pillar dials remained in common use, but the numbers of direction dials were much higher. During the mediaeval and Renaissance periods various more elaborate designs appeared. These were either intended to be more accurate (such as the Regiomontanus dial, the navicula and the quadrans vetus) or were intended to encompass more forms of sundials (such as the astronomical compendium and the diptych dial). Sundials from this period are often particularly ornate, having been made for wealthy patrons or rich merchants. Few of the cheap, wooden versions used by the lower classes have survived. This page is Copyright 1999, Hester Higton and the Department of History and Philosophy of Science of the University of Cambridge. All Rights Reserved.